The raw material out of which music by Mark Mahoney & Michael Peck is realized is not old cosmic music LPs but the ebb and flow of life. 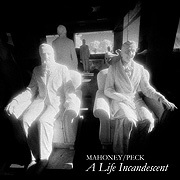 Their CD A Life Incandescent (49'29") continues to show Mahoney & Peck as a duo living in sound. On this release they do their best to light up a dark genre that too often suffers from vapid exploration. There is more to this music than spacing-out. Treating the soundfield like a canvas their music demands imaginative interaction and asks the listener to re-align our sensitivity to sound. Through subtle gradations of tone and timbre Mahoney & Peck achieve a surreal dreamlike soundscape. From molecular whispers in the blood to an acceleration of energy, the eight pieces on A Life Incandescent move the mechanisms of the mind to embrace the immensity of which we all are a part. Drones, resonant sweeps, slow evocative solos and swirling digital chaos over thick analogue foundations all characterize the sonic components of this work. The rhythmic parts are equally original with clear arpeggiations skipping skyward or grainy percussion loops stretched and tweaked. The freedom expressed on A Life Incandescent is compelling - and Mahoney & Peck use their improvisational skills to move easily between a number of moods and atmospheres. From an inward stillness to euphoric revelations and all in between, this audio experience is not so much about their lives as it is about the labyrinthine journey of all creative lives.